Below: Eubrontes giganteus trackways on an ancient Jurassic mudflat. 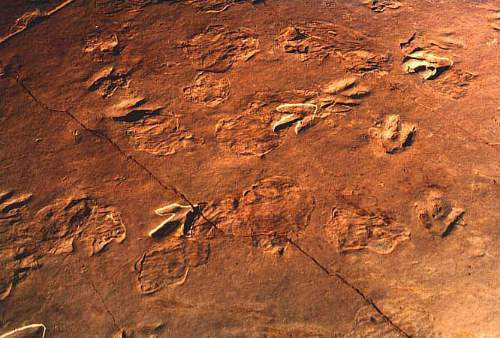 at The Pratt Museum of Amherst College, Massachusetts, U.S.A.
and see examples of hundreds of Early Jurassic dinosaur footprints in that collection. Courtesy, Dr. Paul E. Olsen, Lamont-Doherty Earth Observatory. Because of Media interest, everyone with a television set has probably heard about the asteroid that created the Chicxulub crater at the eastern end of the Yucatan peninsula, and is familiar with the theory that IT caused the extinction of the dinosaurs. But did you also know that there is very strong evidence that another asteroid impact ushered in the Age of Dinosaurs 143 million years earlier? It caused extinctions that decimated the fauna and flora of North America, causing 60-80% of all plant and animal species to become extinct (Olsen et al., 1990; see the paper by Fowell et al., 1994, which documents the palynological evidence for a mass extinction at the Triassic-Jurassic boundary). The recent detection of an Iridium anomaly by Dr. Denis Kent at the boundary in the Newark basin, combined with an earlier documentation of a fern spore spike at the boundary, provides powerful evidence for an asteroid impact event. That Mass Extinction allowed surviving Early Jurassic dinosaurs to quickly become dominant and to rule the Earth. In other words, the Age of Dinosaurs came in with a BANG and went out with a BANG (201 mya to 65 mya)! 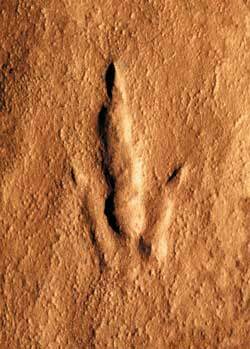 Links to the Asteroid Theory of dinosaur origin and dinosaur extinction. Olsen, P.E., Fowell, S.J., and Cornet, B., 1990. The Triassic/Jurassic boundary in continental rocks of eastern North America; a progress report, 585-593. In Sharpton, V.L. and Ward, P.D. (editors), Global catastrophes in Earth history, An interdisciplinary conference on impacts, volcanism, and mass mortality. Geological Society of America, Special Paper 247. Fowell, S.J., Cornet, B., and Olsen, P.E., 1994. Geologically rapid Late Triassic extinctions: Palynological evidence from the Newark Supergroup, 197-206. In Klein, G.D. (editor), Pangea: Paleoclimate, Tectonics, and Sedimentation During Accretion, Zenith, and Breakup of a Supercontinent: Boulder, Colorado, Geological Society of America Special Paper 288. New abilities to detect layers of "space dust" in the Earth's crust are building geological evidence that comets or asteroids colliding with Earth not only helped wipe out the dinosaurs, but may have originally helped bring them to prominence about 200 million years ago. Dennis V. Kent, Rutgers geology professor, was among a team of geologists who analyzed footprints, bones and plant spores in more than 70 locations in eastern North America, as well as iridium dust and magnetic fields in four corresponding sediment layers in the Newark Basin. The team published its findings, "Ascent of Dinosaurs Linked to an Iridium Anomaly at the Triassic-Jurassic Boundary," in the May 17 edition of the journal Science. "Finding the element iridium, which is common in space objects, creates a time marker for comet or asteroid impacts." said Kent. "Correlating the finds with evidence of plant and animal life helps to tell us what happened." Using high-resolution spectrometry technology provided by Christian Koeberl of the University of Vienna in Austria, the scientists were able to make unprecedented comparisons of iridium levels in the parts-per-trillion range. Kent said another important find was a thin zone in the sediment, just below the Triassic-Jurassic boundary, where the magnetic field is reversed. This reverse zone can now serve as a marker to help identify the boundary location in the geological record. "Our research adds to the speculation that there was a comet or asteroid impact about 200 million years ago, followed relatively quickly by the rising dominance of dinosaur populations of the Jurassic period," said Kent. He suggested that the effects of the impact killed off or reduced many competitive species, clearing the way for dinosaurs to adapt and flourish. "Dinosaurs went on to dominate for the next 135 million years," he said, noting that their extinction is now commonly attributed to the ecological effects of yet another comet or asteroid impact -- this one about 65 million years ago. Besides his work at Rutgers, Kent is associated with the Lamont-Doherty Earth Observatory of Columbia University, as are his co-authors E.C. Rainforth and P.E. Olsen. 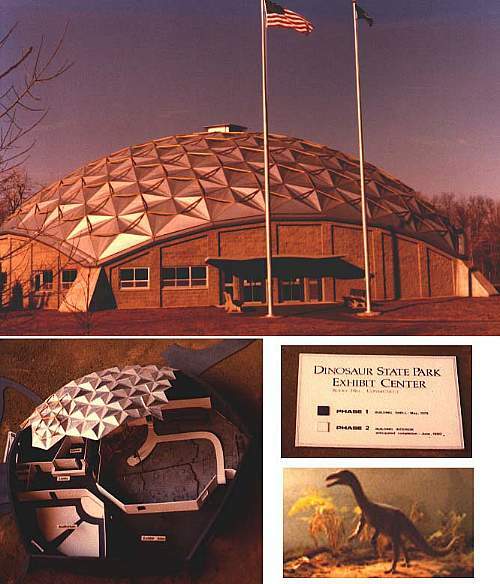 Olsen's earlier research about Triassic-Jurassic transitions inspired the project. Other co-authors include Koeberl and H. Huber of the University of Vienna, H.-D. Sues of the Royal Ontario Museum, A. Montanari of the Osservatorio Geologio do Coldigiocom in Italy, S.J. Fowell of the University of Alaska-Fairbanks, and M.J. Szajna and B.W. Hartline, fossil collectors of Reading, Pa.